They are too busy being awesome at what they do. Elder SUP is simply a collection of stories told from the SUP Perspective. In my seventh decade, it’s been incredible to discover a sport that connects generations like few others. In 2017 I collaborated with Zane Schweitzer with his book, Beneath the Surface. That project inspired us to develop a series of journals for adults and for kids, the Blue Life Journal. I realized immediately that no matter how many people made it their practice to write daily in their Blue Life Journal, if there wasn’t a way to connect that energy, attitude and action, the power of the process could be less than optimal. Our Oceans deserve our very best effort. We need to act now and we need to act together. For that reason, I am putting heart and soul into creating BLUE LIFE CONNECTIONS – social media, digital reach, global corporate partnerships and an easy-to-access app (Fall 2018). Discovering down wind races and re-discovering surfing has fed my SUP fire since 2007. Now a fledgling yoga practice has delivered a new mindful aspect to my SUP adventures. (Power of Presence – active meditations connecting mind, breath and movement for walking and SUP). As I turn 69 this June, my energy will be invested in creating a legacy – and everyone can be a part of that. Join me for now on our fledgling home – on Facebook. 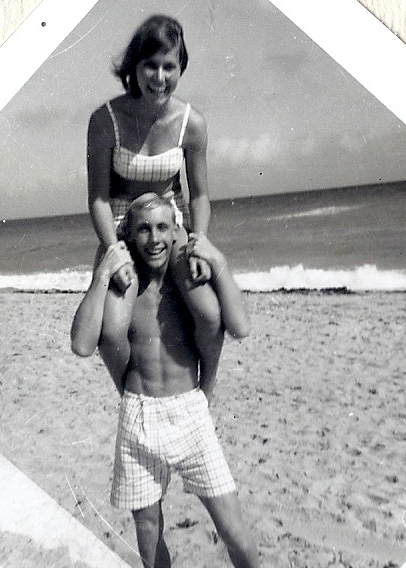 In the late 1960’s my boyfriend, Ed – now my husband of 46 years – and I spent every spare minute surfing the sloppy waves off Hollywood, FL. College, life and work, sailing and raising kids interrupted our surfing – until we re-discovered it via the standup paddle board way in 2007. Totally wrapped in 5-4 wetsuits we enjoyed surfing off Pacific City OR, Tofino, BC and around every beach we could handle across the Hawaiian islands – most recently the Maliko Gulch down wind run. After a 40 year gap, it was youth-restoring magic all the way! Our story is not as important as YOURS – share with us on Facebook. If you are a water athlete or serve our industry, we can write your blog, create web content and deliver active social media programs. Connect with us via Water Words by e-mail. Judy’s Karmathon and the video by KOHD TV Thanks for the video – by Chip Booth Standup Paddle Bend You can join our Facebook page too. I just saw this – so happy for you! Hi…My husband and I own a company called SURFit USA–focusing on bringing the waterman lifestyle to everyone. We are organizing a SUP adventure tour of Juneau Alaska this summer and think it will be tons of fun. We are so excited about it even though we have never really paddled in cold water. I would love to hear your thoughts on cold water paddling. We also teach SUP fitness and coach here in Sarasota Florida and would love to reach out to older athletes as we truly believe that the waterman lifestyle is good for everyone–regardless of age! So happy to find your site. -Aloha! Hi Judy, I’m sure we’ve met before, but my memory isn’t all it could be. I think it was Altzheimers but I’ve always been this way. Just stumbled across your blog. Nice. Fun reading about Peggy since she’s a friend and downwinding buddy. I’m 68, live in Hood River and Haiku (actually Piahi, but everyone thinks that’s the name of the wave, not a location). Been SUP paddling (surfing, racing, downwinding) since about 2005. I do a couple of blogs in fits and starts–Ponostyle and xGeez. Say hi next time you’re in the Gorge. We get back in early may. I assume you do downwinders given your circle of friends. .